With the beginning of a new year, they say you should bury the hatchet and start anew. Well at Georgia HFMA, we figured that going to Bury the Hatchet and throwing axes was close enough! With the beginning of a new year, they say you should bury the hatchet and start anew. 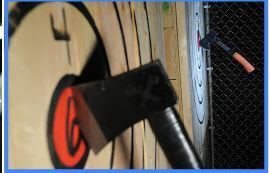 Well at Georgia HFMA, we figured that going to Bury the Hatchet and throwing axes was close enough!